Oh that traditional baked goodie you devoured as a child at the breakfast table! So sweet and delicious and made the whole house smell like sunshine. Where did those days go? Why isn’t anyone baking me delicious sunshiny goodies on a Sunday morn? I feel so neglected. Pout. One of my favorite Banana Bread recipes is actually not traditional at all: it’s vegan. Why vegan, you ask? I have no idea. Sometimes I like to pretend I’m vegan. And covered in tattoos. And can ride a motorcycle. Because all those things seem to go together. I love that this recipe features no refined sugars and almost no fat. Very healthy. Sort of. If you want to up the nutrition value of this bread even more, sub half the white flour for whole wheat flour. Add an extra tablespoon or two of applesauce to compensate for the denseness whole wheat flour usually adds. Set oven to 350 degrees. Spray a bread loaf pan with vegetable oil. Sift your dry ingredients, set aside. Blend your wet ingredients in a large bowl. If you want a really fine banana bread (no banana chunks) you can blend in a food processor. Slowly blend in your dry to wet. Fold in 1/2 cup of nuts of your choice if you like. Pour mixture into pan and place in oven. Bake for 30-40 minutes. Allow to cool slightly before slicing. Though you and I both know that never happens. 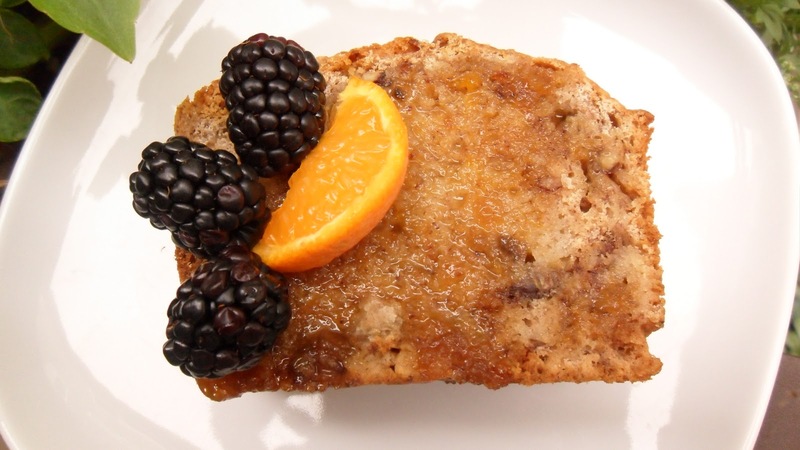 I made a loaf of this bread the other night and decided to up the wow factor by “frying” pieces in a mixture of fresh squeezed orange juice and honey in a pan. The sugar from the honey crisps up the edges of the bread and adds a bit more sweetness. Top with fresh berries or whip cream and some toasted nuts. Yum.